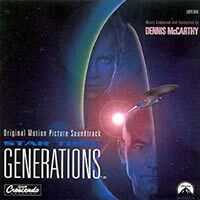 Now available again is the score to the 1994 feature film debut for the cast of STAR TREK: THE NEXT GENERATION featuring music by series composer Dennis McCarthy. In STAR TREK GENERATIONS, the eras of classic and next generation TREK collide as both Captain Picard and Captain Kirk must team up to stop a mad scientist gaining entry to a mystical temporal nexus at the cost of the lives of the Enterprise crew. Dennis McCarthy was given the chance to deliver a score with a much larger orchestra than was used during the course of the NEXT GENERATION television series. The result for GENERATIONS is a non-stop action-driven piece that will keep the listener hooked. Album also features a collection of original sound effects from the movie, many of which were also used in the TV Series.